What If Christians Elect The Antichrist? Donald Trump secured his third victory in a row last night, taking over 45% of the vote in Nevada. News organizations are now reporting that his path to the Republican nomination is almost certain--barring a miracle. 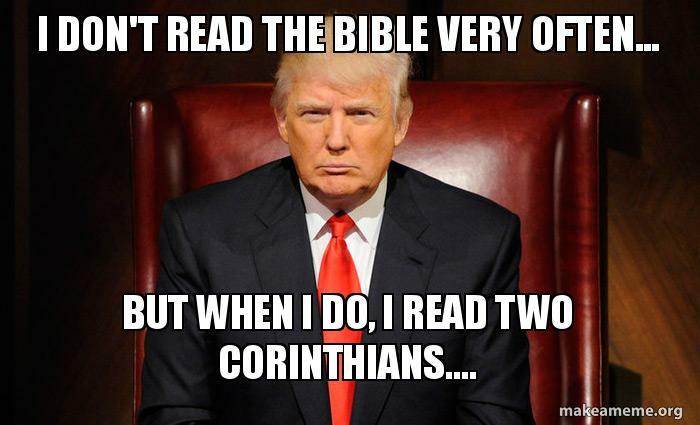 Amazingly, a third or more of evangelicals are so desperate for someone, anyone, to fix the country that they would be willing to hand the keys to the kingdom to a man who is the very epitome of vice and greed--a man whose constant and intentional boasting sounds eerily similar to Daniel 7:8, Daniel 11:37, and Revelation 13:5. This man loudly proclaims that he is a Christian -- a Protestant, even. Yet his now deceased "Presbyterian" pastor was unquestionably a blatant universalist who even denied the necessity of being born again. In fact, when questioned about his faith, Trump admitted he has never even asked God for forgiveness. During his previous run for President in 2000, he wanted avowed universalist Oprah Winfrey to be his vice president. Is this man the antichrist? By no means can that conclusion be drawn yet, but I will be investigating to see if he should be included on our list of candidates. What a sad reflection on the dead American church. With all of this said, I could be very wrong about the man. While he's not a Christian, perhaps he will be a Nebuchadnezzar, serving God's purposes nevertheless. I certainly agree with a number of things Trump is saying... I can only hope, though, that he really believes what he's telling us (minus the self-TRUMPeting stuff). There are a lot of strongly pro-Trump Christians out there, but I think there are also a number of other supporters who just see him as the least bad of the options available. Cruz may say a lot of things Christians like to hear, but his eligibility is suspect, and he has been known to support pro-globalist legislation. Rubio also has questionable eligibility. Carson seems pretty good, but at this point he's a long shot. We don't have a lot of good choices in 2016. Everything is in God's hands. His "will" be done. I do see with open eyes our country is leaps and bounds worse than Sodom and Ghamorra (sp). Also, Hillary is pro-choice. Our babies are being murdered at an alarming rate. Recent studies stated one in every four births are aborted. Additionally, Hillary has escaped legal penalties for her crimes. If it was you or I who lied to Congress, deleted 33,000 plus emails, WE WOULD BE IN PRISON! I pray with all I have Hillary not to be elected. I can only see trouble and misery for Americans. However, I do believe we are in the end times.God had spoken to us through His word, do not let these things trouble you as they must come to pass for My will to be done.